A zoo in Australia has held a 175th birthday party for one of the world's oldest known living creatures, a Giant Galapagos tortoise. Australia Zoo, where the tortoise has lived for the last 17 years, marked the day with a pink hibiscus flower cake. Although the animal's exact date of birth is not known, DNA testing has indicated its approximate age. Some people believe the tortoise, known as Harriet, was studied by British naturalist Charles Darwin. Darwin took several young Giant Galapagos tortoises back to London after his epic voyage on board HMS Beagle. DNA testing has suggested the giant creature was born around 1830, a few years before Darwin visited the Galapagos archipelago in 1835. 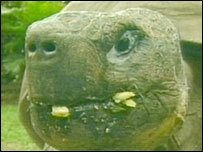 However, Harriet belongs to a sub-species of tortoise only found on an island that Darwin never visited. At the time of Darwin's visit, Harriet would have been about as big as a dinner plate. She now weighs 150kg (23 stone) and is roughly the size of a dinner table. According to the BBC's Phil Mercer, in Sydney, Harriet has become somewhat of a celebrity at the Australia Zoo on Queensland's Sunshine Coast. She receives a thorough wash every morning and is fed a vegetarian diet that includes green beans and celery. Her keepers believe she has survived for so long because she has enjoyed a stress-free life.